There are more "gluten-free" dining options than ever before, but can you trust them? There’s a good chance some of the “gluten-free” dishes you’re ordering at a restaurant actually aren’t. When restaurant goers armed with portable gluten detection devices checked foods advertised as free of gluten on the menus of eateries across the country, about one-third of the dishes — 32 percent — contained the substance, a new study presented Monday at the American College of Gastroenterology Annual Scientific Meeting found. Pizza and pasta were the biggest culprits, with about half of the “gluten-free” versions of those dishes at restaurants still containing gluten. The time of day also made a difference: Gluten contamination was higher during dinner than at breakfast. With increased awareness of celiac disease and gluten-free diets in the last few years, there are more gluten-free dining options than ever before, but based on the findings, the expanded menus may give people a false sense of security, said lead author Dr. Benjamin Lerner, an internal medicine resident at NewYork-Presbyterian/Columbia University Medical Center. Even eating one meal containing the substance — a protein found in wheat, rye and barley — can affect people with the condition, Lerner said. Celiac disease is an autoimmune disorder that causes damage to the lining of the small intestine when patients consume foods with gluten. It affects about 3 million Americans, though some people go years before getting a diagnosis. 'Eating just made me sicker': Why celiac disease is such a frustrating diagnosisWhile receiving a celiac disease diagnosis is a relief to many, living a gluten-free life remains challenging. “Eating just made me sicker,” Rachel Carlson, a Pittsburgh woman who was finally diagnosed with the disease last year, told TODAY. The only treatment is a strict gluten-free diet, but while the U.S. Food and Drug Administration has rules for products labeled as “gluten-free,” it applies only to packaged foods. 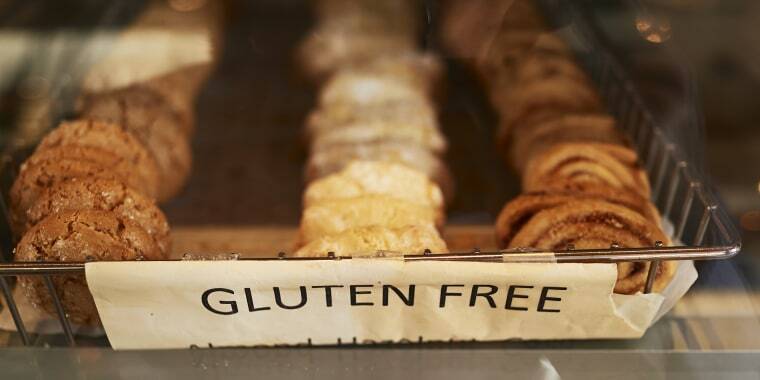 A radio show in St. Louis recently caused a stir when an anonymous caller said she worked at a bakery that lied about its gluten-free foods. Why did so many restaurants drop the ball? The study is based on more than 5,600 dishes tested at restaurants across the country over 18 months by 804 people who used portable gluten detection devices. Lerner and his colleagues believe eateries are making good-faith efforts to provide gluten-free options, but may lack education on how to properly do it. If a restaurant is baking regular pizza and the gluten-free version in the same oven, for example, they might come in contact with each other, with some flour perhaps transferring gluten that way, Lerner noted. When it comes to pasta, a restaurant may be preparing both versions in the same work space or using the same pots. “Cumulative contamination” over the course of the day may explain why there were higher rates of gluten contamination during dinner. At the beginning of a restaurant’s day, surfaces and dishes are clean and it’s easy to keep ingredients separate; but as the hours go by, one work area may bleed over into the next if the kitchen is not very neat, Lerner said. Some people have non-celiac gluten sensitivity, experiencing symptoms even though they don’t have celiac disease. It makes sense for them to avoid gluten if that makes them feel better, Lerner said. Others who have no sensitivity believe a gluten-free diet offers health benefits, though there’s no good evidence for that, he added. “Gluten often is present in foods that are high in carbohydrates so if someone is having a gluten-free diet, they also might be having a lower-carb diet. So in that sense, someone might lose weight, they might feel better. Is it the gluten? It’s really not clear,” Lerner said. Besides cutting down on carbs, a gluten-free diet also may reduce your fiber intake, so it’s important to make sure you’re still maintaining a balanced diet, he noted. Is a gluten-free diet for you? “First, it’s important for people who are avoiding gluten for whatever reason to just understand that a gluten-free label at a restaurant shouldn’t be taken at face value. There may be some gluten in those food products,” Lerner said. If you want to order gluten-free pizza or pasta, be aware these dishes in particular may still contain gluten at many restaurants. Don’t be shy about asking questions about how they're prepared. Remember: It’s not easy for a restaurant to offer truly gluten-free options, but it’s definitely realistic since 68 percent of the dishes in the study were just as advertised, Lerner said.